Wow. What an experience! Let me start by being upfront: I have loved reading Haruki Murakami for a long time. There are some books I’ve liked more than others, but I’ve never felt disappointed. With 1Q84, once again I had a very memorable reading experience that left me feeling that this was time well spent. 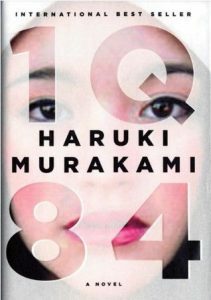 It is not a requirement to have read George Orwell’s 1984 before reading Murakami’s 1Q84. References to Orwell are common enough (Big Brother, for example) and at one point, a very brief overview of Orwell’s book is given during a conversation between characters. Throughout the book there are these little threads, even very early on, which are all joined together by the end. A number of references are made hundreds of pages apart from each other, happening to different characters, even; yet not one tiny detail is forgotten. Pretty much every note I made as I was reading turned out to be useless for review; I really do not want to spoil this experience for anyone. I will say that I loved how much I didn’t see coming. I loved the surprises, the suspense, the intrigue, the mystery. But again, that is all done within Murakami’s surreal, magical world, so don’t expect an action-packed novel. At times it feels more like suspended animation. Time feels like it’s happening at different rates and in alternate streams. It’s a lot to take in. There has been chatter about the possibility of a Book 4, but I like the ending as is. I can’t help but feel that Murakami has taken the best aspects of his early works and combined it with the best aspects of his most recent, ending up with 1Q84. I agree with those who have referred to 1Q84 as Murakami’s magnum opus.